It's Not All About the Coupons to Save Money! Don't get it twisted. I do love couponing. Thing is, my life doesn't revolve around it. I used to spend a LOT of time on couponing until I realized that I was spending a lot of time and money that I didn't need to. I've tried really hard to not present couponing to the people that watch my videos as the only way to save money because the math proves that it just isn't true. Depending on your coupoining style, it can actually cost you money if you aren't careful. That's why I occasionally do videos on things like Swagbucks and Amazon. Those sites among others are able to save a lot of money for Cory and I here and there. We recently got 3 gallons of Valspar paint for the house for under a dollar and I will soon be showing you that we also got FREE wallpaper paste and carpet strips to help with the cost of the house remodeling. Not one dime was saved with coupons and I didn't spend a dime to do it. Sometimes we get so wrapped up in couponing and buying the smallest item that the coupon is meant for that we forget a few important details. One is the math. Others are that not everything can be couponed and not everything NEEDS to be couponed to get the best deal on it. How much is it per item in the box, or per ounce or per pound? Unless the item is straight up and genuinely free with a coupon, the math is really important here. For example, CVS is running a deal on Dawn dish soap along with other items this week. When you spend $20 you will get a $5 ECB back. So if your store participates in the 98% rule, you could get 20 of them for $19.80 and you would get back a $5 ECB to spend later. (I would suggest NOT buying all 20 in one transaction/day/store.) That makes them .74 each or 9.25 cents per ounce. Thanks to all the coupon misuse out there that has caused P&G to lock down their coupons with size restrictions and limits, that's about the best deal that you will find per ounce on Dawn. Even if you had the .25/1 common coupon that they put out today, you can't use it on this size, would only be able to get them one at a time if you follow the rules, and the math still says this deal is better. And you aren't dropping a single coupon in the mix to get them. I'm doing this deal because Dawn dish soap is my go to and in today's coupon/deals world, that's a rock bottom per ounce price for it that is hard to beat. When I do this deal tomorrow, I won't have to purchase dish soap for the rest of the year. So I won't need to spend the time to look for dish soap until the number dwindles and I can darn near guarantee when I need dish soap again, there will be a deal for it. With or without coupons. Take it from someone who has been doing this for 20+ years, there's ALWAYS another deal. I did a deal on Amazon today with Prime Pantry. Yes, I have Prime on Amazon and I also pay the $4.99 per month Prime Pantry fee and will address how that is beneficial to us and actually does save us money in my next post here. What I'm showing you now is just one example of what I do with Prime Pantry. The $4.99 a month that I pay for Prime Pantry is made up in one transaction because instead of having to purchase $35.00 to get the free shipping, I only have to do $10.00 and that's $10.00 BEFORE any coupons or discounts. So I don't have to purchase another $25.00 to get the free shipping, or spend that extra $5.99 to pay for shipping that when you did the math, makes the deal not so sweet. Free shipping is a tactic that companies use to get you to spend more money, but I'll address that further in my next post on Amazon Prime that I mentioned earlier. That also means that I can do multiple transactions to purchase larger quantities of the $6/5 items since my total only has to be $10.00 before coupons to get free shipping. You can only do the $6/5 once in each transaction. I did this order twice for a total of 10 jars at $1.80 each. We don't eat this stuff all the time, maybe a few times a month as a snack with chips, so those 10 jars should last us for the rest of the year. We have chips to match so no more snack deals are in the cards for us until these start to get low. When that time comes, there will be a deal waiting because there is always another deal. Those are just two examples of real money savings and being aware that you don't need to tote around a backpack of clipped coupons and go shopping every day in order to get the best deals and save real money. Cory and I save money on things like meat and produce all the time and we do sometimes pass on good or great deals because we took advantage of a deal before so we don't need the item. Kroger is running Keebler crackers for .99 each this weekend but we won't be doing that deal. We love Keebler crackers but we already have quite a few boxes from a previous deal that I did and we don't eat them all the time. Usually we will break out a sleeve if we are having stew, soup or chili but that's about it. While .99 a box is a great price, it's still .99 out of pocket for each box. They would sit in the pantry for who knows how long until we finally got around to eating them. Buying them now would not save us money. It would be spending $4.95 on something that we just simply don't need because we already have enough to last a while. Those $4.95 transactions can add up to quite a large number quite quickly if you aren't paying attention. We did recently take advantage of a deal on ribeyes at a local store called Earth Fare. They were on sale for $9.99 per pound, boneless. That's not an awesome price but it's pretty good for around here. We didn't go all willy nilly though. We asked them for 6 steaks, 2 in a package and that's what they did for us. We aren't big red meat eaters (or meat eaters in general because meat is expensive and not necessary in every meal) but when we do eat it, we want something that is going to be good quality and taste great. The occasional ribeye with blue cheese butter is simply amazing. Our thoughts is quality at the best price. Not quantity. Being able to save money on the things that you need and want is so much more than coupons. Especially when it comes to food. Couponing can be exhausting and messy if you let it take over your life. You can't get everything that you need or want by using coupons. You can however save money on everything that you need and want if you aren't locked into the couponing mind set trap. I'll leave you with this... Not everything can be couponed, but you can save money on everything. A little food for thought as we go forward here. Happy Saturday and I'll see you soon! It is going to be so much easier for me to tell you about this deal here than in a video. 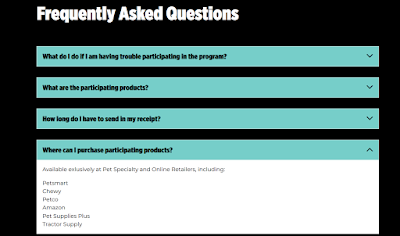 Plus I think it will eliminate a lot of questions because we are going to go through how to do this step by step. 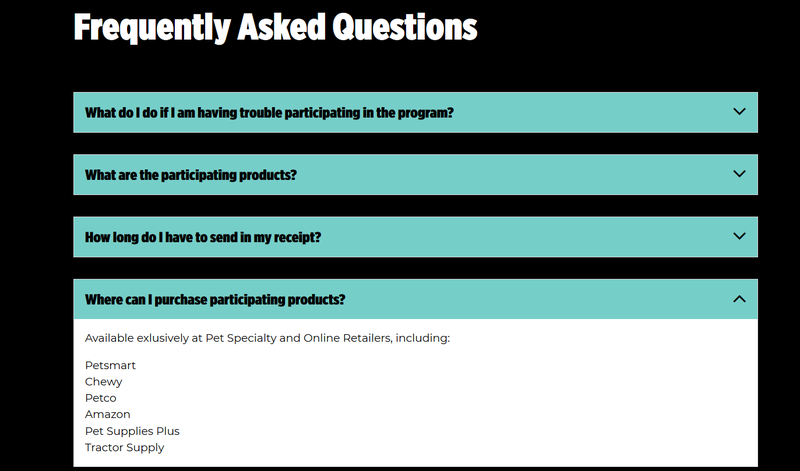 Now Pro Plan is a higher priced pet food but with $10, the chances of getting a smaller size bag cheap or even free are pretty good but I had a few questions like, where do I buy it and what size bags are included? They have a FAQ, so that's where I went. You can find it under the support tab on the website. The answer to where can you buy it tickled me pink... because I'm kinda lazy. When I saw Amazon as an option, now that made me happy. The other retailers are Petsmart, Chewy, Petco, Pet Supplies Plus and Tractors Supply. I'm showing you Amazon because that's how I bought mine. If you haven't figured it out yet, I kinda really dig Amazon for many different reasons. A few of them being the Prime benefits, their prices can be fantastic and their customer service is top notch. I also read the Terms and Conditions. I'm weird that way. I read the TOS and TAC for everything because I really do want to know what I'm agreeing to. That's why I don't have Facebook Messenger on my phone. Anyway, included in the terms of service for this deal is an entire list of the sizes and variations that are included. If you want to see that list, click here to go to the terms and conditions and scroll down. You can't miss the list. That list is important because you want to make sure you are purchasing the correct size/type of product to get your gift card. I decided that I would get a nice bag of food for Sally so I did cat food this time. I went to Amazon and grabbed a 7 pound bag of the SAVOR Chicken and Rice. The price was $9.99 and that size/type is on the list in the terms and conditions. I made the purchase. The cat food will be here on Wednesday. I did the deal in my comfy pajamas without having to get dressed and go out in this nasty, cold snowy weather. I love that. Two thumbs up for easy deals! So now all I have to do it claim my $10 gift card. How do I do that? Well, they make it REALLY easy! 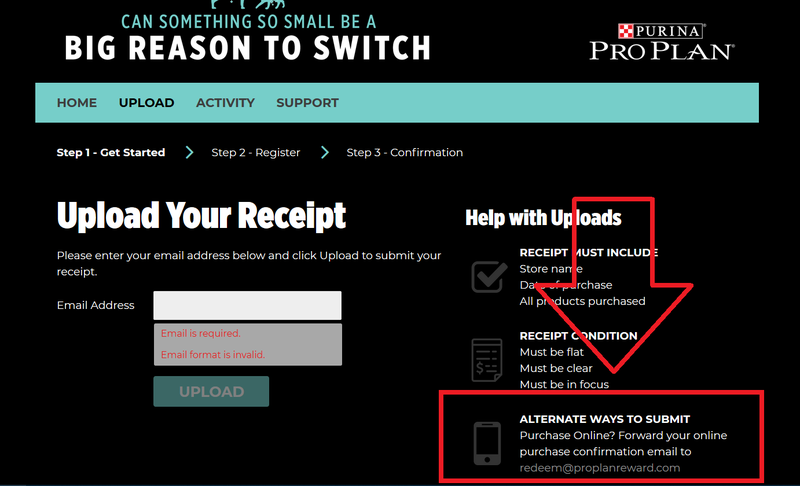 Where it says "Alternate Ways to Submit Your Receipt" you will see the email address redeem@proplanaward.com. When you receive your confirmation email from your online purchase (mine was Amazon) you just forward that email to that address. 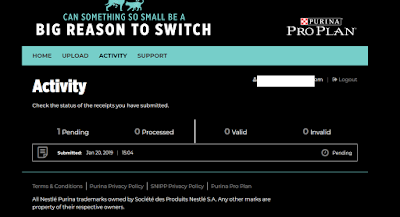 You will receive a confirmation email from Purina that they have received your submission. Then another email will arrive asking you to register. 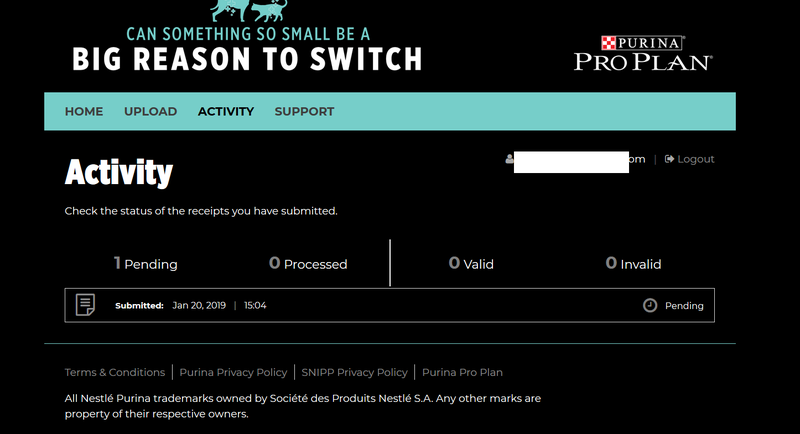 You fill out the regular stuff that we always do with your name, address (Purina has been known to surprise their subscribers with coupons and little things in the mail on occasion) phone number and your email will be pre-filled out. Just fill out the form and submit it. 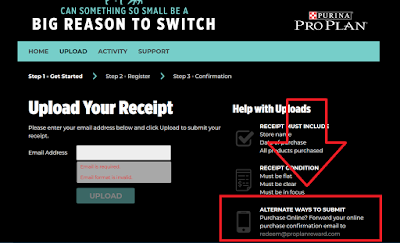 You will then receive a third email with a url and a pin number that will allow you to follow the process of your gift card being approved. They say it will take up to 2 weeks to receive your gift card but I'm guessing I will receive mine soon after Amazon shows that it has been delivered on Wednesday. The rules are that you are only allowed one redemption per email address and household so this is a one and done. I'll make another post when my gift card is approved so be watching the Community Tab on my YouTube channel for that. I will be converting this Visa card over into an Amazon gift card. I showed you how to do that with a video a while back when we had the SC Johnson gift card deal. If you missed that video or need a refresher, you can watch it below. So with this deal, I will be getting Sally a 7 pound bag of nice cat food and will be getting back the price of the bag. I'm just out the sales tax. And they are dropping it off at my door! Sweet! Looking for the dog food version? Well here ya go! 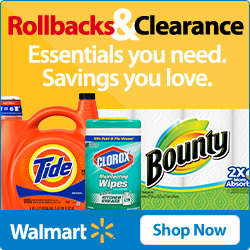 They range in price on Amazon from $10.19 to $10.99 and if you are a Prime member, your shipping will be free. If you have any questions about this deal, let me know in the comments below or on my Community Tab post for this deal. Again, when I get my card I'll do another post on this deal. Happy Sunday and I hope you have been enjoying your weekend! Earn Free Gift Cards for Shopping Like You Do Anyway! Disclosure notice: This website contains affiliate links. If you click on any of the links, I will receive some sort of monetary compensation for anything that is downloaded or purchased. Spudward and Sophie thank your for your contribution to their kibble fund. 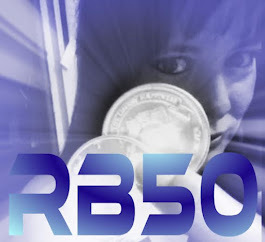 Copyright 2016, 2017, 2018 by RB50. Awesome Inc. theme. Powered by Blogger.